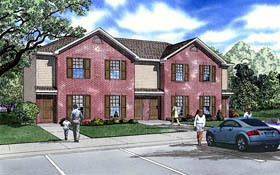 This multi-family design features four housing units. On the main floor of each unit, the generous great room merges with the kitchen area. A half bath, laundry area and rear patio complete the main floor of each home. Two bedrooms and a full bath are available on the upper floor of each unit, along with access to an attic storage area. This design may be just the multi-family plan you've been looking for.